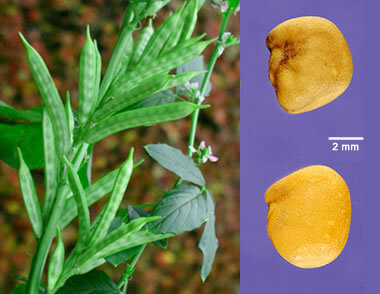 Guar beans: Left: guar bean cluster, public domain image created by R. Loganathan. Right: guar beans, photograph by Tracey Slotta, United States Department of Agriculture, ARS Systematic Botany and Mycology Laboratory. Powder made from the bean of a relatively unknown plant grown in India and Pakistan can quickly turn water into a very thick gel. The beans are typically used to thicken sauces and processed foods such as ice cream and ketchup. Now, drilling companies who need high-viscosity water to extract oil and natural gas from tight rock formations are buying up guar beans as fast as they are grown. The surge in demand has multiplied prices and lured many new farmers into the guar bean business. Historically, India and Pakistan have produced over 80% of the worldwide supply of guar beans. However, farmers in Texas, Oklahoma and other states are now planting guar beans to take advantage of these high prices. Enormous quantities of oil and natural gas are trapped in subsurface rock units that are so tight that fluids cannot flow through them. To liberate the oil and natural gas, drilling companies pump fluids down a well under pressures that are high enough to fracture the subsurface rock units. This process is known as hydraulic fracturing. Adding guar bean powder (also known as guar gum) to this water increases its viscosity and makes high-pressure pumping and the fracturing process more efficient. High-viscosity water is needed for a second reason. Sand grains or other tiny granules are mixed with the water that is used for the fracturing process. When fracturing occurs these granules, known as "proppants," are carried deep into the rock unit by the sudden rush of water that accompanies the opening of fractures. When the pumps are turned off, water pressure within the fractures drops and the fractures close suddenly. If enough proppants have been carried into the fractures, they prevent the fractures from closing completely. These partially-closed fractures then become passageways that allow oil and natural gas to flow out of the rock and into the well. High-viscosity water is much more effective at suspending sand grains and carrying them into the fractures. 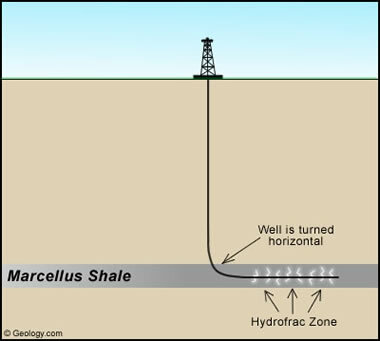 Hydraulic fracturing: This illustration shows a natural gas well being developed with hydraulic fracturing. The Marcellus Shale is the gas-bearing rock unit. The well has been drilled down to the Marcellus and then turned horizontal to penetrate it for a long distance. The fracturing is done within the Marcellus to facilitate the flow of gas out of the rock unit and into the well. Guar beans, also known as cluster beans (Cyamopsis tetragonoloba) have been cultivated in northwestern India and Pakistan for at least several centuries. Guar is an annual legume that grows well in a variety of soil types and in arid to semiarid climates. The leaves and beans of the guar plant have traditionally been used as an animal feed and as a vegetable for human consumption. Farmers take advantage of the nitrogen fixing abilities of the guar plant by using it as a green manure crop. Guar beans are husked and milled to produce a white powder known as guar gum or guaran. Guar gum is water soluble and is used in recipes as a thickener. It is very similar to corn starch - but has about eight times the "thickening power." Guar gum is used in baking as a dough thickener. It is used to thicken dairy products such as milk, yogurt, cheese, ice cream and sherbet. In processed foods, guar gum is used as a thickener in salad dressing, sauces, ketchup, soup and many other products. Guar gum has medicinal uses which include: water-soluble fiber, bulk-forming laxative and creating a feeling of satiety. Traditionally most of the world's supply of guar beans was used as food for animals and people with a small amount going to the food processing industry. However, in the last few years the use of guar gum in hydraulic fracturing began to increase rapidly. This sudden increase in demand caused a ten-fold increase in price. In 2011, India exported guar worth $915 million to the United States, with most of the product intended for oil and gas industry use. It was India's largest agricultural export to the United States. Guar farmers in India responded with increased acreage, and India's largest processor of guar gum distributed 3,000 tons of free seeds to farmers who wanted to test the crop. The high prices are expected to decline as more Indian farmers plant guar beans; however, price volatility is still possible. Growing guar in India is a risky business because the crop must get the proper amount of monsoon rain that arrives at the proper time in the growing cycle. In the United States, chemists are trying to find a substitute for guar gum, and farmers in Texas, Oklahoma, and other states are planting guar to offer a domestic source of supply.